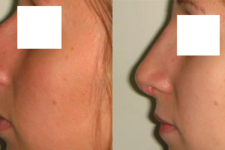 We practice rhinoplasty under outpatient surgery: entry in the morning and exit in the evening. 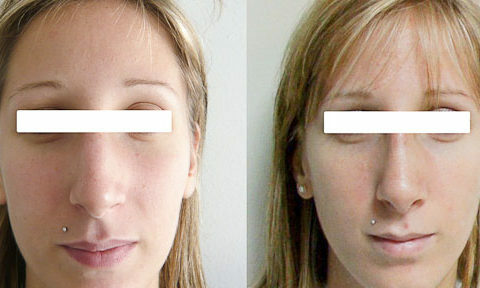 Rhinoplasty is not very painful and leads to 3 to 5 days off work. 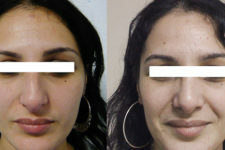 Rhinoplasty rate may vary between 4000 to 6500 euro according to the difficulty of each case. The procedure consists in modifying the nasal pyramid morphology (either partially or completely) and aims to correct some potential breathing issues. 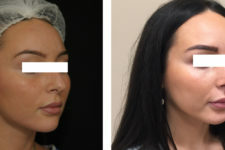 –Rhinoplasty sealed way, in which scars are concealed inside the nostrils. 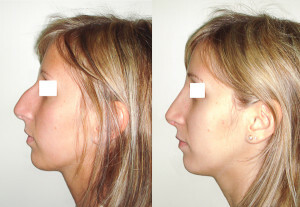 It is the most common technique when the main modification is the nasal roof (resection of the osteocatilaginous bump). 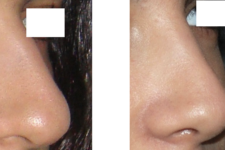 It enables to lift the tip of the nose and to correct deviated nasal septum. It is a quick and simple procedure which only gives very few post procedure edema. The final result is quite fast, approximately 3 months after the surgery. –Open way rhinoplasty: the scars will be located cross the columella(skin area under the nose separating the two nostrils), which enables to access and visualize the full osteocatilaginous shape of the nose. 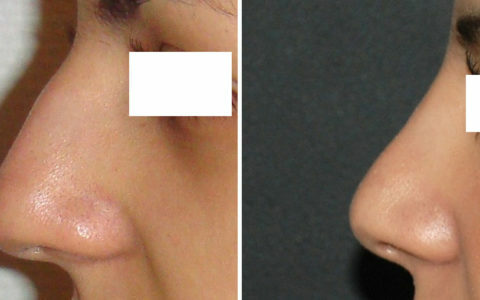 This technique is suggested when there are major modifications needed on the tip of the nose or for secondary rhinoplasty (correction after a first procedure that the result was not satisfactory). Furthermore, there might be external incisions required on the nasal wings if we need to reduce the size of the nostrils. 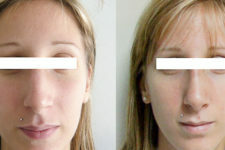 The postoperative recovery takes longer due to the inflation of the tip of the nose which last approximately 2 months. 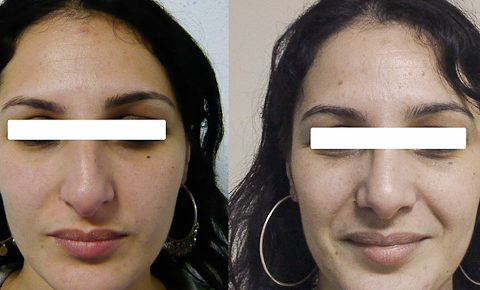 The final cosmetic result is obtained between six to one year after the procedure. Before the surgery, an examination of the respiratory tracts (rhino manometry) or a facial scanner can be asked to preempt any potential obstructions of nasal airways. The procedure is usually practiced under general anesthesia but we can also consider neuroleptanalgesia (local anesthesia further by tranquilizers administered intravenously) in case of simple act (tip of the noise). This will require a pre anesthetic consultation, at least 48 hours prior the procedure. In most of cases the procedure is practiced in ambulatory surgery (entry at 8am, and exit at 7pm on the same day). A resin thermos performed splint will be placed at the end of the procedure and must be kept for 5 to 7 days. In case of open way rhinoplasty, the stitches located on the columella will be removed on the 5th day. 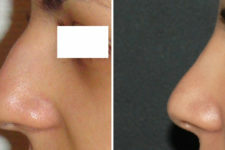 In case of closed way rhinoplasty, the stitches located inside the noise will resorb naturally in 10 days. The procedure is not painful, but it may be difficult to breathe through the noise during the following week after the surgery, due to the swelling of the nasal mucous membranes. Bruises are not systematic, and the return to work can be considered from the fifth day following the procedure. More than 90% of our rhinoplasties are practiced under ambulatory surgery. 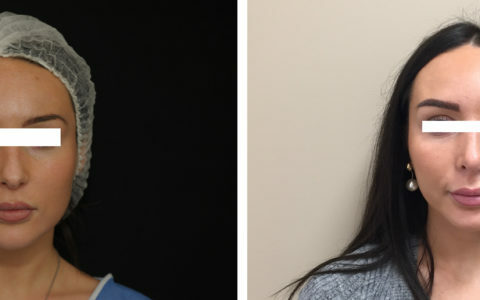 We favor minor touch-ups to keep the identity of our patients in order to avoid the complications of rhinoplasties “old time’s surgeries”: nose too snub, nostrils too lifted up, and breathing issues. We discuss about the considered acts, in preparatory, with the patient based on simulations made by Photoshop. It’s about a simple surgery that doesn’t hurt and gives great results when its preparedness has been meticulously done. No, rhinoplasty might cause some discomforts but is a little or no pain. It’s possible to have breathing issues during 3 to 4 days because of the edema of the nasal mucosa. 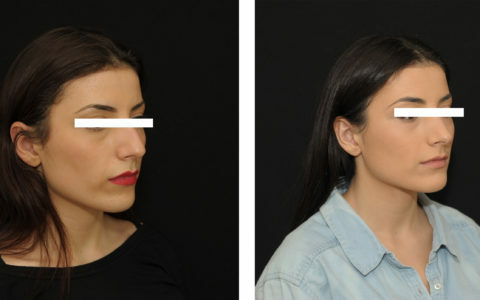 Will I recognize myself after a rhinoplasty? 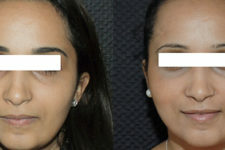 Yes, the purpose of a rhinoplasty is to correct a nose that is not harmonious with the face, not to change your identity. The acts that are practiced are the most discreet and aim to not modify the global architecture of your face. 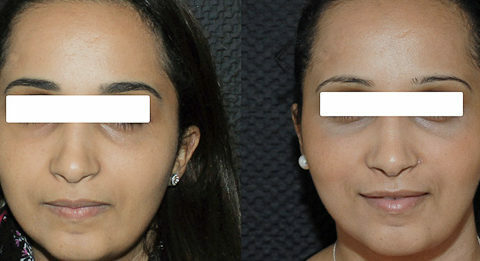 What are the most practiced acts during rhinoplasty? 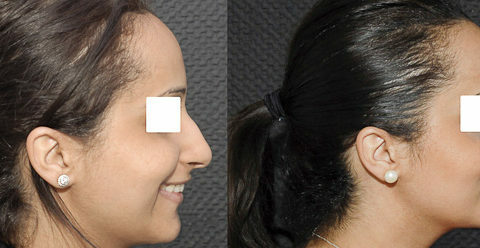 -a refinement of the tip of the nose by removing the alar cartilage located on the upper edge. 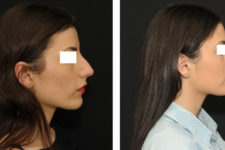 -the backward and the raise up of the tip of the nose, reducing the projection of the nasal septum. -the ablation of the bump of the nose (or bossectomy) which is followed by a narrowing of the nasal sclera. 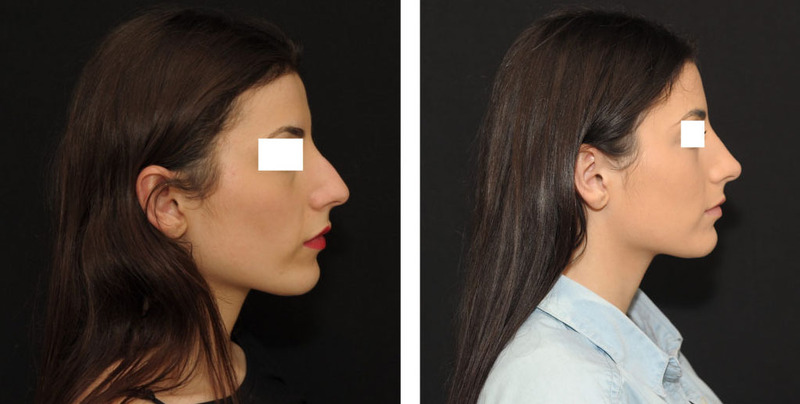 What are the potential complications of a rhinoplasty? 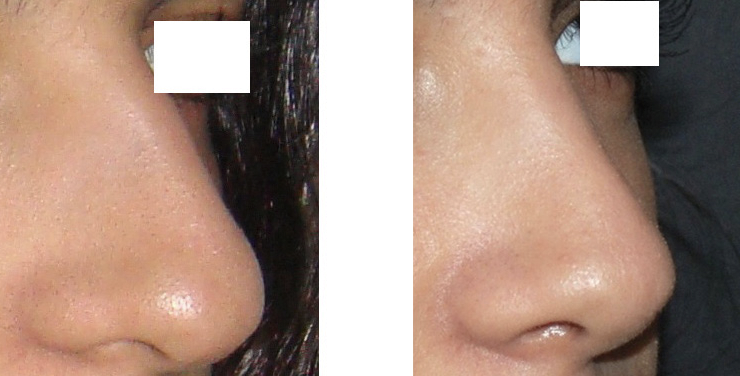 The principal immediate complications of a rhinoplasty are the bleeding of the nose post-operative. Fortunately, this is very rare. This requires a nasal packing to stop the hemorrhages. 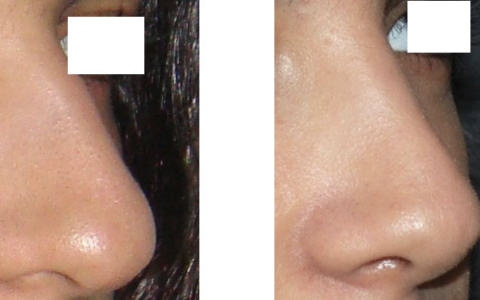 Regarding the long term complications of a rhinoplasty, it is mostly about a bad aesthetic result post-operative. This is due in 80% of those cases to a bad appreciation of the expectations of the patient by the surgeon. We notice that the procedure has been too aggressive, giving to the nose an “American way” look. 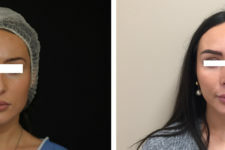 In order to understand the best patient’s wishes, one or even two pre-operative consultations are required, with discussions and edited images with the use of Photoshop. 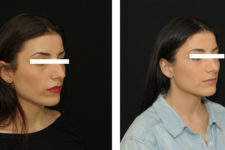 Moreover, we should keep a conservative surgical strategy to adopt by achieving measured acts that would no modify radically the aspect of the face. 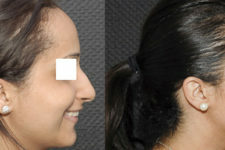 At last, we should always make sure we don’t remove too much cartilage and bone during a rhinoplasty. In fact, not only for the aesthetic aspect, those anatomic structures are an essential function for nose breathing. Therefore, if too much alar cartilage is removed (from the tip of the nose) it can cause prematurely close the wings of the nose during deep inhalation (collapses of the external valve). 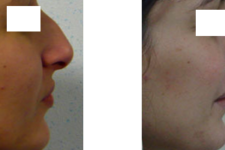 Listening to the patient and measured acts are the keys of success of rhinoplasty. 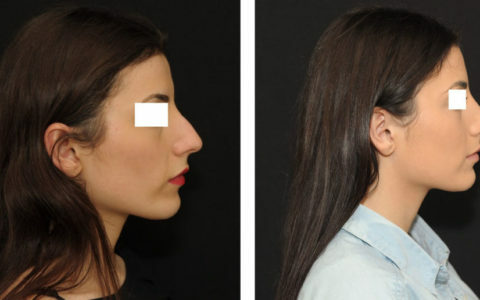 Are there any rhinoplasties that are taking care by the national medical insurance? Yes, some cases that result from a trauma or a deformity can be covered by the social security. For example, post traumatic nasal septal deviation (deviation to the right after a punch for example) causes a discomfort while nasal inhalation. Your case will be analyzed by the counselor doctor of the national medical insurance; he will use the scanners examinations or rhino manometry (examination that characterizes the obstruction of the nasal cavities). The charges of the rhinoplasty by the national medical insurance will not be fully covered. The quotes of our fees must be sent to the health insurance to know how much will be taken care. 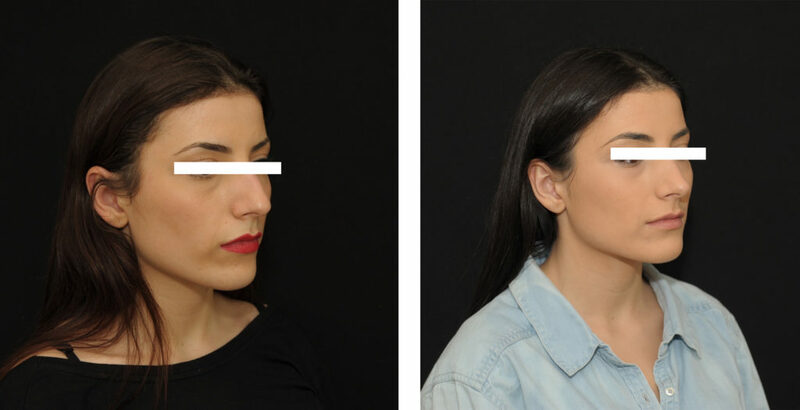 What’s the cost of a rhinoplasty? In the case of a coverage by the national medical insurance for a post traumatic deviation, our fees mays vary from 2500€ to 4000€ according to the difficulty of the case. The fees can eventually be taken care by your private health insurance. In the case of an aesthetic surgery purpose, the full amount of the hospital expenses will be on your charge including the VAT.